On March 2nd, Apple reached the milestone of 25 billion apps sold and to celebrate, released a list of the top 25 apps. For this list, I have used the top 25 American iPhone paid apps, to be specific. The release date means more recent successes, such as Draw Something and Angry Birds Space, are not included. The only app on the list that is not a game, Camera+ allows you to take photos through the app, or import from your library, and add all sorts of filters and effects to make them look much more professional. Since it was released in June of 2010, the app has always been high up in the App Store’s “Top 25” section, showing the most popular apps based on downloads. 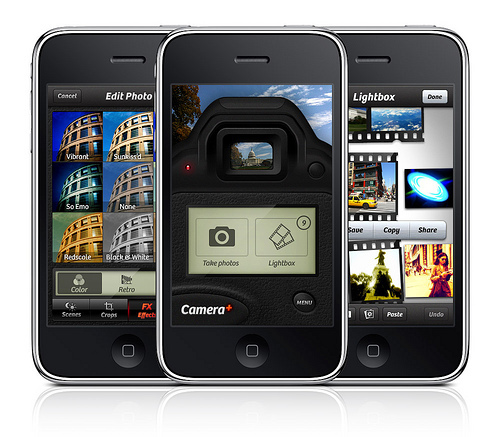 Its amazing filters are what sets it apart from the mass of camera apps available. In Pocket God, you control a small group of pygmies on a deserted island. You can kill them in a variety of ways, including tornadoes, sharks, and eating a deadly fish. As new “episodes” were added as updates, many more islands were added to the game, the number of pygmies increased, and a variety of minigames became available to play. The app even crossed over with the popular Doodle Jump (also on this list) and The Moron Test. All three of the Angry Birds app released before the list was complied made it to the top ten. 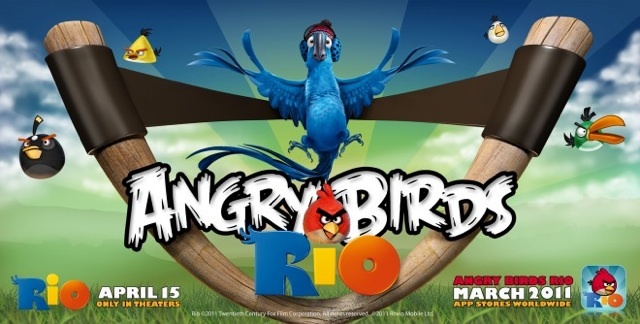 The game was released as a tie-in to the popular 20th Century Fox movie Rio, which was one of 2011’s highest-grossing movies. 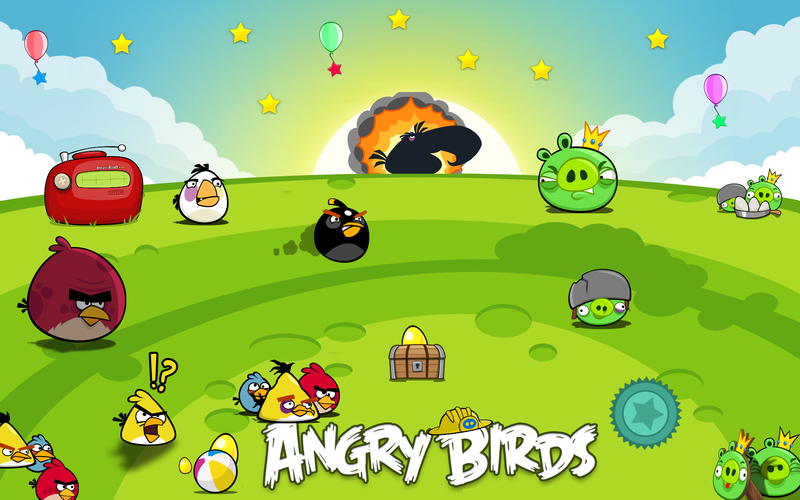 Although the app never quite reached the heights of the other Angry Birds games, it has still been successful every since its release, and was seen as a positive step forward for the growing franchise. Bird apps are always popular, and Tiny Wings was no exception. 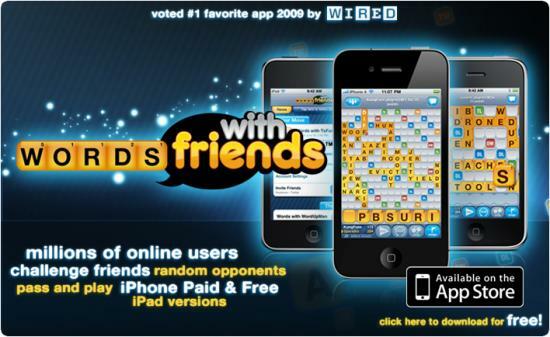 Released in February 2011, it went on to become chosen as the iPhone’s paid app of the year. The game features a small bird with tiny wings, hence the name, who cannot fly. But luckily for the bird, the islands it lives on are covered in hills. 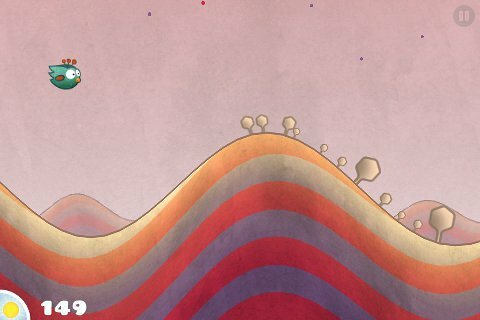 Using simple one-touch gameplay, you must use the hills as ramps to fly the bird along, collecting coins and fulfilling achievements along the way. The islands’ color schemes also change daily, which was one of the app’s biggest selling points. Zynga took Scrabble, added a social element, and produced one of the most popular and famous apps of all time. It would probably be even higher on the list, if not for the free version of the app, which only has a commercial after each move. Amazing stories have already emerged about couples meeting through the app and eventually marrying, and people using it to reconnect with relatives from around the world. It’s push notifications system allows users to see exactly when their friends have taken their turns. 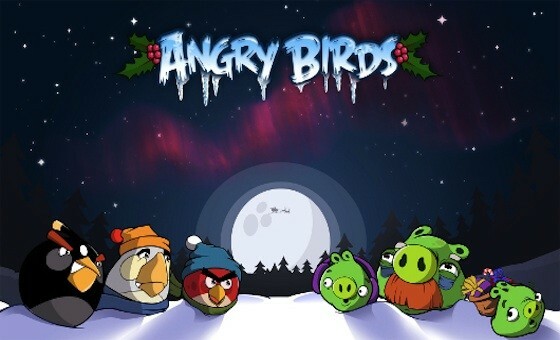 The second game in the Angry Birds series, Seasons has remained popular because of its constant updates. Every time a major holiday comes along, a new section is released with about 15-20 levels in that theme. The updates have gotten creative, with summer and cherry blossom festival levels added. A new bird (the orange bird) was even added to the franchise through this app in the 2011 Halloween update. It may have become successful because of its predecessor, but Angry Birds Seasons in definitely no longer riding any coattails! 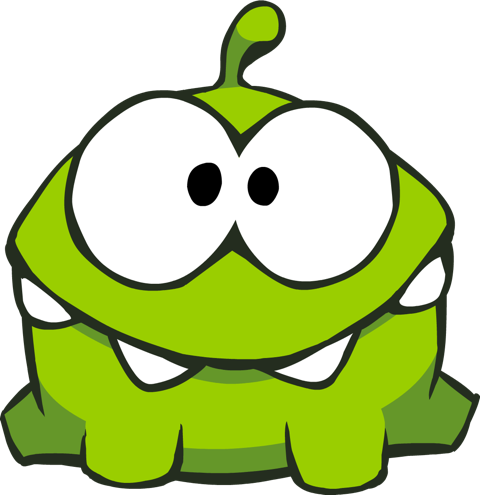 Om Nom has become one of the most popular characters to emerge from the app period. He is a small green monster with a love for candies. Your job is to cut ropes in order to get the candies to his awaiting mouth. The app, developed by a Russian company, took only 9 days after its release in late 2010 to be purchased 1 million times, and to reach the top of the iTunes charts. A less-successful sequel, Cut the Rope: Experiments, was released a year later. 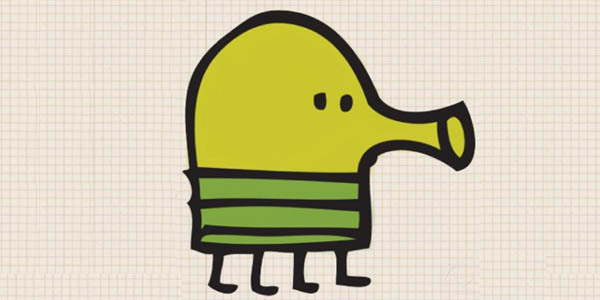 One of the app that most successfully crossed over, Doodle Jump is now available on 9 platforms, including Kinect and Xbox 360. The game currently features 9 themes in which “The Doodler” can jump, including one released especially for the 2010 FIFA World Cup. Updates have slowed down recently, however, with only one new theme added in the past year. Despite this, The Doodler has become extremely popular, and even made it to TV, being featured in two episodes of The Big Bang Theory, and even has even been used as an accessory for Lady Gaga. Right now the only app that can compete with the Angry Birds franchise is Fruit Ninja. Released in April of 2010, it was an instant success. 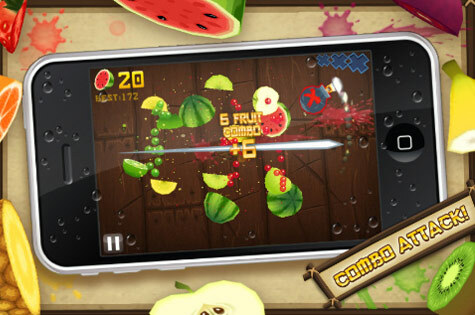 The addictive nature of the game is evident, as players want to keep on slicing fruit! It was later released for Kinect. The multiple gameplay modes have helped fuel the success of Fruit Ninja, with Zen, Classic, Arcade, and Multiplayer all being available. A sequel was released as a tie-in to Puss in Boots, and was moderately successful, although nowhere near as big as the original. How could any other app be the most popular of all time? When you think of the word app, Angry Birds is the first thing that pops into your mind. And the app that started it all back in December of 2009. For some reason, the idea of catapulting birds at pigs caught on, and now you can’t go anywhere without encountering of the app’s famous characters. Rovio, the Finnish company behind the app series, has stated their goal is to become bigger than Disney, and with upcoming TV shows, movies, and the latest release Angry Birds Space breaking all records, that goal may just become a reality in a few years time. Great list, thought that Tiny Tower and Hanging with Friends may have been on there – was surprised to see Pocket God up there, never enjoyed that game myself!